The Antique American Indian Art Show puts historic art in focus. Now in its fifth year, the Antique American Indian Art Show stands out among the Native arts events happening across Santa Fe in its sole focus of historical material. A direct prelude to Indian Market, this year’s Antique American Indian Art Show kicks off Tuesday, August 14, and continues through Friday, August 17. The show welcomes more than 65 knowledgeable American Indian art dealers, including Blue Rain Gallery, Buffalo Barry’s Indian Art, Four Winds Gallery, John C. Hill Antique Indian Art, KR Martindale Gallery, Mark Sublette Medicine Man Gallery, Miles 8: Miles Trading Co., Trotta—Bono Ltd. and Turkey Mountain Traders, who will showcase thousands of pieces of historic Native art. “In August, the place to acquire the highest quality antique Native American art is the Antique American Indian Show. 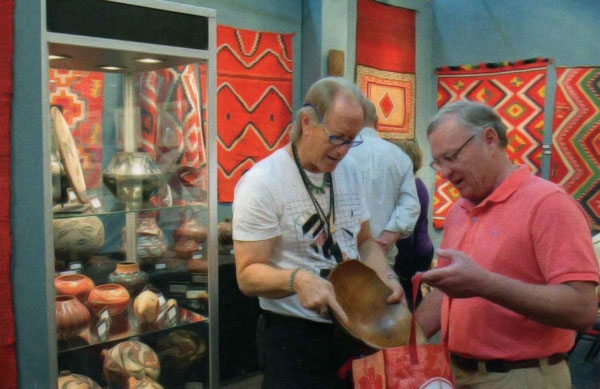 My gallery has a large booth at the show, and I always save a few special items for the event,” says Mark Sublette, president and CEO of Mark Sublette Medicine Man Gallery. This year, among the items at his booth are a Navajo Six Figure Yei rug and a Teddy Weahkee-designed necklace and earring set. 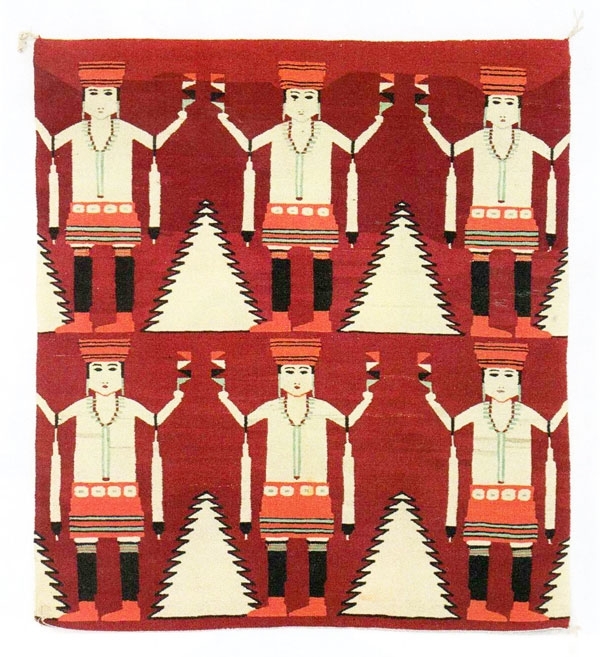 Navajo Six Figure Yei Rug c. 1920's, 79.5" x 67"
Also at the show will be a special exhibition on Germantown weavings, dubbed First Modern Art because of their innovative color use. The pieces were created around 1870 to 1900 with yarn commercially spun and dyed in Germantown, Pennsylvania. “They’re almost like paintings done in wool,” says show producer and textile expert Kim Martindale. “There’s one type called an eyedazzler, with contrasting colors right next to each other. It’s so vibrant, something we don’t see in painting until the modern era. In 1870 and 1880 no one was painting like this yet!" This year, the Antique American Indian Art Show is proud to participate in the newly styled Native Art Week, which encompasses all the Native art events occurring in Santa Fe surrounding Indian Market. “Santa Fe Indian Market is really the anchor event for the contemporary art portion of Native Art Week, while we're the historic anchor,” says Martindale. "The whole city is engaged in the Native American art community, as well as all the people coming in from all over the country. It’s the moment for American Indian art - there's no place like this at any other time." A lunchtime lecture series sponsored by Native American Art will take place during the show as part of Native Art Week. The discussions will take place Wednesday, Thursday and Friday, with the final lecture on collecting historic and contemporary Native art being moderated by Native American Art editor Joshua Rose.